We love “The Boxcar Children.” Many curriculums, whether public, private or home school, have these wonderful books on their reading list. This series seems to be a huge hit for children of all ages. Finding a good, clean series that is age appropriate can be a challenge. My oldest loved this series so much that we acquired quite a collection of them. This movie is based on the first book of the series. Four orphaned and homeless siblings happen upon an abandoned boxcar, which with a little creativity and hard work, they gradually furnish with all the comforts of home. Fearful that they will be sent to live with the reputedly cruel grandfather they have never met, the children keep their new home a secret – until a serious illness forces them to reveal themselves in order to save young Violet. Featuring an all-star cast of voice actors, including Academy Award Nominee Martin Sheen (Apocalypse Now), J.K. Simmons (Spiderman), Zach Gordon (Diary of a Wimpy Kid), Joey King (Fargo), Mackenzie Foy (Twilight series), and Jadon Sand (LEGO: The Movie), this is the very first full-length, animated feature adaptation of Gertrude Chandler Warner’s best-selling classic! I didn’t find any major inconsistencies between the movie and the book. My two oldest boys have read the books and they both loved the movie and have been asking to watch it again! Also, neither one of them could find any inconsistencies the book. 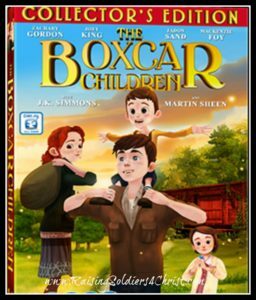 In fact, my mom watched the movie with us and she is ready to purchase the entire Boxcar Children DVD series! Have you heard your children saying something in that “slangy” talk? We all have heard it. I can’t stand all the slang talk in movies, especially children’s movies. I am THRILLED that this movie had NO slang talk or bad words. It is a wonderful, clean story that your entire family can enjoy watching over and again. My kids ages are 10, 7, and 5 and all of them loved it. I give the movie 10/10!!! If you love this book series you will want this movie! The Dove Foundation gives this movie a Family-Approved rating for kids of all ages. You can order it HERE off Amazon. You can order at the links above OR click below for your chance to win ONE copy!!! We have just started reading the Boxcar Children together. We are on book 1 and it has been way too long since I read them for me to remember specific stories. 🙂 I love that I can enjoy them again with my boys. Our three children spend a lot of hours reading the Boxcar Children. They have a hard time narrowing their choice to a favorite. They would say the title of which ever one they were reading at the moment. The original Boxcar Children was one of my favorite books as a child – I still have my old hardback copy! 🙂 My son likes the mystery stories that came later. Our young’ns would love this. (I would love this!) Thanks for the great review! It’s soooo nice to find clean dvd’s for the family. I just heard of these books and I can’t wait to start reading them to our children!! They will love them!! I read many of the Boxcar Children books as a child, but I always loved the first one best. I enjoyed reading about their adventures after they moved in with their grandfather, but there was something about the idea of living alone out in the woods that I thought was just wonderful. My son likes the first book best! we have not read them, but would love to!!! The Boxcar children series really helped get my reluctant reader into a book. We still like #1 the best. It has been awhile since I have read them, but my niece has read each and every one. This set would be for her, as she would LOVE it!!!! I remember reading this series as a child…vaguely. It is hard to find “good” material.